Any structure being part of a building must comply with relevant building codes. Any independent structure such as a free standing mezzanine must be capable of withstanding a horizontally applied force of 120 kg in any direction at the point of attachment. Stockmaster Mezzalad adapts to any floor height within a given range by automatically adjusting the angle of incline between 60 and 70 degrees to the floor. Service heights are given in the table below. 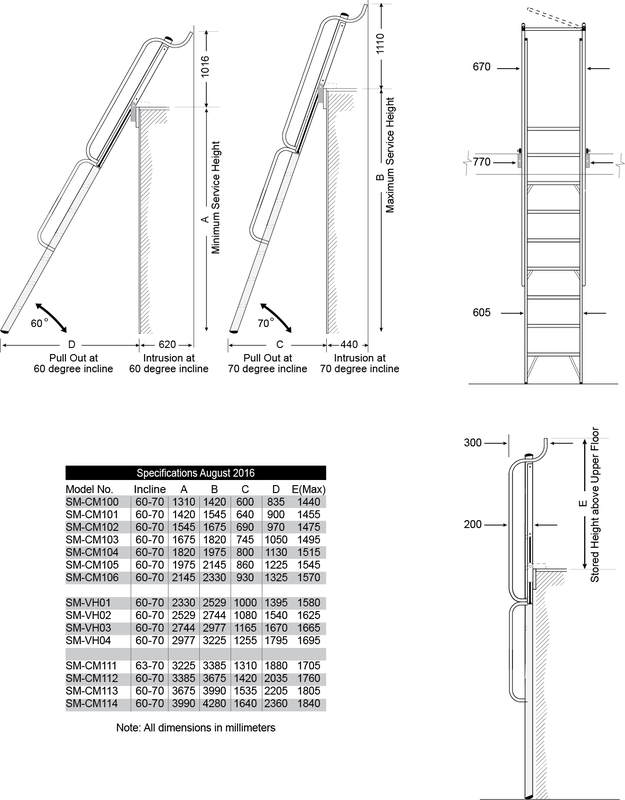 In the open or use position Mezzalad requires space for the user to safely mount and dismount the ladder. When standing in front of the ladder the minimum desirable distance between the base of the ladder and any wall or obstruction behind the user is 0.8 meters and should not be less than 0.6 meters. Pull out dimensions are given in the specifications below. For use in confined areas, check the available operating space and consult your dealer who can provide you with the exact pull out dimension for your installation. When moving from the open to the closed or stored position the height of the ladder above the upper floor will increase. The increase in height will depend on the angle of incline of the ladder to the floor when in the open or use position. 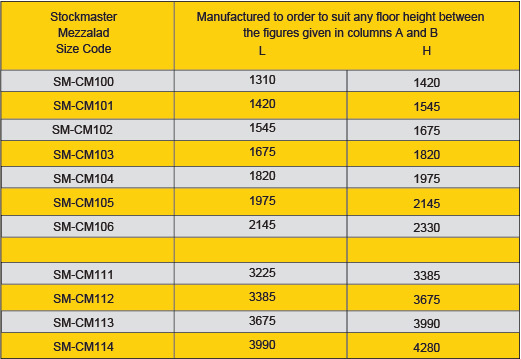 The maximum Stored Height above the Upper Floor is given in the specifications table below. For use in confined areas, check the available operating space and if necessary consult your dealer who can provide you with the exact Stored Height above Upper Floor dimension for your installation. When moving from the closed to the open or use position the ladder will intrude into the upper floor area. The degree of intrusion will depend on the angle of incline of the ladder to the floor when in the open or use position. The minimum and maximum Intrusion into Upper Floor dimensions are given in the specification drawings in the Dimension diagrams below. If necessary consult your dealer who can provide you with the exact Upper Floor Intrusion dimension for your installation. Mezzalad is designed for personnel access between floor levels including access to Mezzanines, Lofts, Loading Docks and Storage Areas above Factory Offices and Tea Rooms etc. The product is not intended for use to convey large or heavy items between floor levels and conveyance of items must be limited to small and light items that can be carried in one hand and permit a three point contact when ascending or descending the ladder. Note: This product does not substitute for stair access where required under the building code.